Add extra branches, employees, transfer accounts and who receives important notifications in your business. To view your business details, click the profile icon from the top right corner from any page and click Settings -> Business Settings. Business Logo: This is your brand logo so your customers can easily identify you on Hubtel. Business Name: This is the name of the business that is approved for use in your country of operation. Sector: This is a high-level business area or category that helps Hubtel to organize businesses. Business ID: This is the name your customers will see anytime you send them notifications. (Email, SMS or In App) from Hubtel. Hubtel Account ID: This is your unique identifier on Hubtel. Provide this ID anytime you contact Hubtel so we can help you even faster. Tax Identification Number: This is the tax identification number for the business. 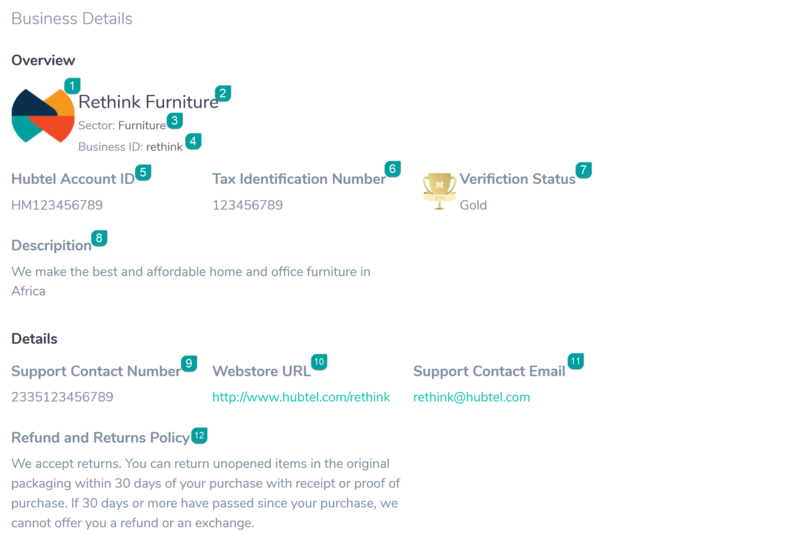 Verification Status: This is how Hubtel wants to classify businesses. The higher you go, the cooler you are customers on Hubtel. Description: This describes the your vision and direction as a business so your potential partners and customers can develop an accurate impression about your business. Support Contact Number: This is to help your customers get into contact with you for help via call. Web Store URL: This is your online web store on Hubtel. This cannot be edited. Support Contact Email: This is to help your customers get into contact with you for help via email. Refund and Return Policy: This is an agreement informing your customers about your policies regarding returns and refunds. To change your refund policy, read this article. a. How many days they have to return a product service. b. How will they receive the refund (credit or replacement). c. If you offer refunds for digital products. d. Who pays for shipping to return the product and so on.